With the Photo Printer Mini by Kodak, you hardly have to lift a finger. This smart gadget is also fully compatible with iOS phones and tablets over Wi-Fi network. Fade-proof dye transfer technology ensures each photo will last for at least 10 years with its humidity- and fingerprint-resistant properties. Mini 58mm Wireless Bluetooth Thermal Printer Receipt Bill Ticket Printing POS WY. Farewell to the traditional dotmatrix printer, now, we provide you with more efficient portable printers! This mini bluetooth thermal printer is lightweight, with excellent connectivity and long battery life. Wide Compatibility: Support for iOS and Android devices and BT 2.0 or above enabled devices. Printing Width: 58mm. 2 ways to connect:USB via computer,BT via phones. Interface: USB BT. 1 Printer. However, it also should be noticed thatApple computers are not able to connect to printer via USB. With the Photo Printer Mini by Kodak, you hardly have to lift a finger. This smart gadget is also fully compatible with iOS phones and tablets over Wi-Fi network. WIRELESS CONVENIENCE - NFC One Touch for Android Launches Kodak App to Print in Seconds; Also Compatible With iPhone or iPad Via Wi-Fi Connection. KiiPix Smartphone Picture Printer is the easy and portable way to let the fun last forever. Open up your KiiPix, place your phone on top, push the button and turn the crank. The only hard part will be choosing which pictures you want to print! System Supported: Windows & Android & iOS. Paper Type: Thermal Paper. 1 Thermal Printer with Paper. Thermal Paper Compatible: Regular/Adhesive/Label. Mini & Cute Appearance: Small and lightweight body, can be put in your pocket or bag, easy to take it anywhere. ● Bluetooth 4.0 connection, the phone connects to the cloud for printing through the App. Unimaginably small pocket printer, the black and white version of polaroid with battery inside, direct Bluetooth connection. WARRANTY: 3 MONTHS. QUANTITY: 1. FUNCTIONAL: YES. BT Version: 4.0. Paper Type: Thermal Paper. 1 Thermal Printer with Paper. Thermal Paper Compatible: Regular/Adhesive/Label. Mini & Cute Appearance: Small and lightweight body, can be put in your pocket or bag, easy to take it anywhere. Interface: Bluetooth. 1 Printer. The interface can be used as a computer connection interface or as a charging port. 1 Chinese and English Manual. 1 Optical Drive. 1 Printing Paper. 1 Data Cable. Support bluetooth 4.0, Android, IOS and Windows function, convenient for you to print data in the device wirelessly. Farewell to the traditional dotmatrix printer, now, we provide you with more efficient portable printers! Simply plug it into your computer or a wall outlet (with optional adapter). ZINK Zero Ink Paper: No Ink. No Hassles. iOS & Android. Bluetooth & NFC. Simply connect your iOS or Android smartphones, tablets and other devices over Bluetooth or NFC, and print wirelessly from anywhere within range. Simply connect your iOS or Android smartphones, tablets and other devices over Bluetooth or NFC, and print wirelessly from anywhere within range. Add emojis, voice recordings, general text, links and a lot more. It can print 58mm width thermal paper with a printing speed of 90mm/sec. It has an automatic paper feed structure, simple and convenient to operate. Paper Type: Thermal paper. 1x Thermal Receipt Printer. Your product description goes here. 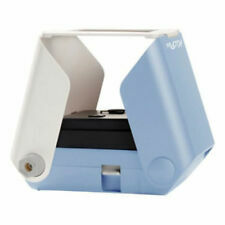 BOCA GHOSTWRITER MINI PLUS THERMAL TICKET PRINTER. For sale is this fully functional BOCA Ghostwriter Mini Plus Thermal Printer. Thermal Printer. If security is a consideration, compare the features of a Mini Plus. Print command: ESC / POS. Printing paper width: 58mm. 1 x Bluetooth Thermal Printer (built-in lithium battery). Bluetooth version: 4.0. Plug: US plug. Color: Black. We will always here to solve them for you. Kodak Mini Instant Photo Printer Prints 2x3" Images 4Pass Technology WiFi &... .
Kodak Mini Instant Photo Printer Prints 2x3" Images 4Pass Technology WiFi & NFC compatible (Android & IOS) Gold. With the Photo Printer Mini by Kodak, you hardly have to lift a finger. This smart gadget is also fully compatible with iOS phones and tablets over Wi-Fi network. Support system: for Windows / iOS / Android. Compact and lightweight, easy to carry, low noise and high speed printing, USB Bluetooth printer. 1 Mini Thermal Printer. 1 Thermal Printer Paper. Paper Type: Thermal label paper. IOS & Android. Bluetooth & NFC. Simply connect your iOS or Android smartphones, tablets and other devices over Bluetooth or NFC, and print wirelessly from anywhere within range. Add emojis, voice recordings, general text, links and a lot more. Portable BT thermal printer in compact size, can quickly print whatever you like. Connection: BT. Type: Thermal Printer. Paper Type: Thermal Paper. 1 Printer. 1 Paper Roll. High-precision print head, clear printing effect and long service life. One tap technology for an effortless printing experience. Wish you could print your phone?s camera roll with the touch of a button? With the Photo Printer Mini by Kodak, you hardly have to lift a finger. Just tap your Android device on the surface of the printer, and innovative NFC one touch has you editing and printing photos in an instant. This smart gadget is also fully compatible with iOS phones and tablets over Wi-Fi network. Watch as the all-in-one ink and paper cartridge produces stunningly detailed color prints in convenient 2.1 x 3.4? size. Fade-proof dye transfer technology ensures each photo will last for at least 10 years with its humidity- and fingerprint-resistant properties. Black and white pixels make sure super clear pictures. Furthermore, it's inkless, which doesn't cause pollution to make it cost-effective. Ink: Inkless. Wide Compatibility - It is suitable for both Android and iOS systems without conflict. The Mini-2 has Bluetooth and NFC connectivity giving you wireless printing capability with just a smart device to hand. Kodak app available for extended editing capabilities. Wireless connectivity – Connect via Bluetooth or NFC for quick print options. This thermal receipt printer can be used via Bluetooth connection, also can be used via a USB drive. Maximum width: 58mm. ESC / POS: Black mark detection Cache: 4KB. Product Type: Portable Receipt Bluetooth Printer. Printing Width: 58mm. Wide Compatibility: Support for iOS and Android devices with BT ability. Interface: USB BT Cash Box. 1 Printer. And choosePOS-58 model after the drive has installed. However, it also should be noticed thatApple computers are not able to connect to printer via USB. The KODAK Mini 2 Printer leverages patented 4Pass printing technology, also known as dye-sublimation, resulting in beautiful, high-quality prints. The Photo Printer Mini 2 by Kodak is here to set you free. Print your photos instantly using the Polaroid Zip printer. The printer allows you to print directly from your smartphone or tablet via Bluetooth or NFC technology, fully compatible with iOS and Android devices. Such as UK, Etec. ● Type: Thermal Printer. ● Connection: Bluetooth BLE 4.0 ＆ above. You can print the note. Replace the printer paper Scan qr code, download the official APP. ● Small body and light weight, conenient to carry in pocket. Features: Strong compatibility, suitable for various brand of phones. The user see all the content information on the phone screen can be print instantly. WIFI connection, the phone connects to the cloud for printing through the App. Memo, record, message, friend sharing. Super small size, easy to storage it in your handbag.